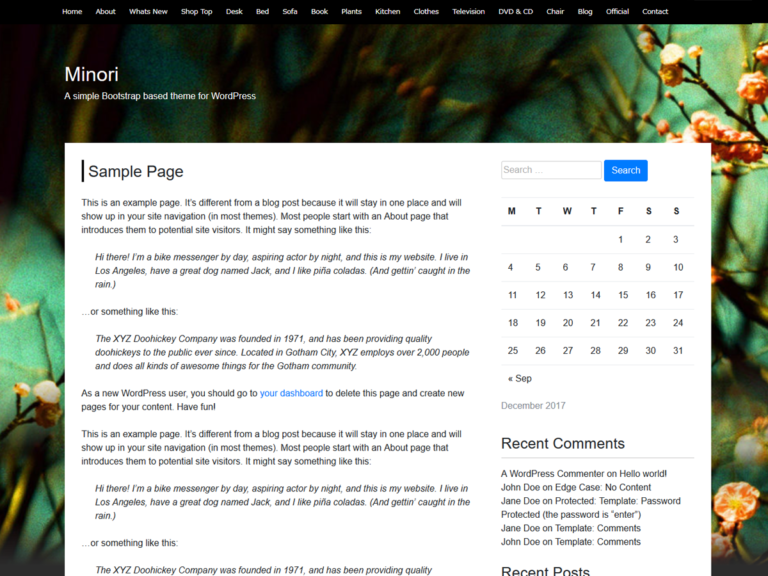 I have released a simple WordPress theme “Minori” using Bootstrap4. It is a theme registered in WordPress Offcial Theme Directory. or search inside the WordPress "theme" section. The reason why I`ve made this theme is that I have listened to the speaker “Yusuke Takahashi`s” presentation at “World Camp Tokyo 2017” on September. It was very helpful that it was the first time to make the WordPress theme by Bootstrap. It is easier than creating the theme from the scratch by WordPress, and users are able to customize easily. Install into WordPress is as follow. 1. From “theme” click “add new”. 2. Click “Upload Theme” from the top. 3. Select “minori.zip” that you`ve downloaded to the computer. Click Install button. “Activate” and select the theme after you`ve installed. You can change the background picture. 1. Choose “Header” from the left side menu. 2. Click “Add New Image”. Then select the picture that you want to upload. You can change the color of the site title. By this, it will adapt to any background picture. 1. Choose “colors”. Next, choose the color that you prefer. I haven`t set “To top” button. This is because that you can set it by yourself using plugins. In that way, you`ll be able to change and customize the button. I will upload the Developments and environment settings files to Git Hub in the future. These announcements will be updated on this page. 2016 09/23　Install "Smart Slider 3" plugin into WordPress"
2016 08/11　Use plugin "Contact Form 7"
2016 07/14　Use plugin "All in One SEO Pack"